It is important to understand the conection between exercise, diet, work and rest. Each has an equal part to play in ensuring happiness and wellbeing. We need to exercise to keep fit and healthy and allow us to work succesfully and enjoy life in our free time. Adequate rest maintains a balance between the two and allows us to function at our best. Finally a balanced diet provides all the essential nutrients our body needs for health, fitness, strength and wellbeing. 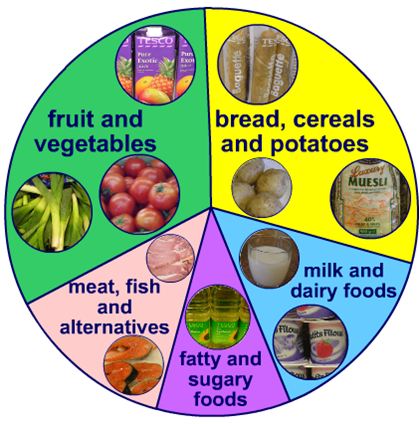 A 'balanced diet' contains the best ratio of nutrients to match your lifestyle. We all need some fats in our diet! Proteins are used to generate energy only when the body has exhausted its stores of carbohydrates and fats. Proteins are especially important for sports people who need to build up large, powerful muscles as they are used to repair muscles and soft tissue. Most important for sports people to have a high protein diet! Carbohydrates contain the fuels that provide us with energy to sustain our performance. Glucose in the form of Glycogen is broken down from carbs to provide energy. Needed for growth and helps with vision.Found in vegetables, eggs and liver! Needed for strong bones. Helps prevent bone softening disease (like osteoporosis) Found in milk, fish, eggs. Can be produced by body in skin when in sunlight. tissue. Used in various chemical reactions. Needed for strong bones and teeth and also used when muscles contract.Found in dairy (milk, cheese etc..), green vegetables and some fish. Used in red blood cells for oxygen to be carried around body. Found in liver, beans and green vegetables. you become dehydrated and your body doesn't work as well as it could. You only use fibre to keep your digestive system working properly. It is not absorbed by the body. There is lots of fibre in fruit and vegetables. When you exercise the body redirects blood around the body to increase the supply of oxygen to your working muscles. Blood is diverted away from some organs, including your digestive. more likely to get indigestion, cramp or feel sick. Endurances athletes use carbo-loading in preparation for races or events. They do this by eating low carbohydrate foods but high in protein for 3-4 days 1 week before their big event. This will allow the body to repair fully and recover from all training. 3-4 days before the final event they will eat high carbohydrate foods such as pasta. This raises the glycogen stores in the liver and muscles. High levels of glycogen is stored as the body is shocked into storing as much energy as possible as it didn't get much carbohydrate earlier in the week. This energy will then be stored for the big event.